Our brand new 750i iron shaft is the lightest steel shaft in the lineup designed to complement the new FC-ONE club head giving clubmakers a finished OEM look. A great alternative to graphite shafts, where improved shot dispersion and distance control is desired. Additional benefits include excellent feedback for the hands and added shock absorption for the joints due to the thin wall light weight construction. The 950i iron is a versatile sub 100g shaft designed for players of all skill levels who are looking for the optimal balance between lightweight and traditional weighted steel. It provides enough weight and balance for the stronger player while providing the average player the forgiveness of a lighter weight product. A standard weight steel shaft designed for stronger players looking for a more traditional feel and heavier swing weights. Stepless geometry gives this traditional technology an ultra modern look. A combination flex design makes this an ideal shaft for the clubmaker to keep on hand for both repairs and custom builds. A constant weight steel shaft designed for stronger players looking for a more traditional feel and heavier swing weights in a taper tip design. 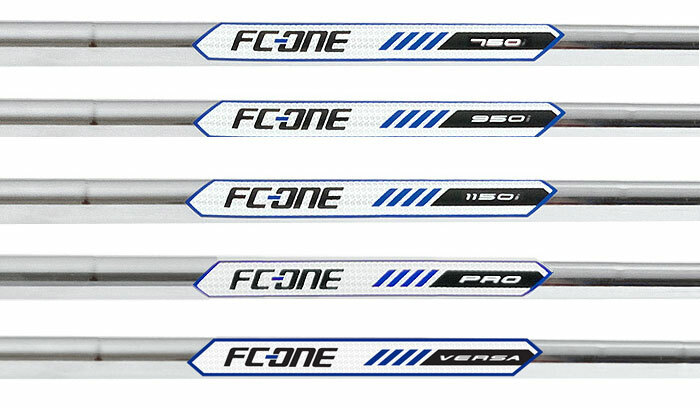 Tour proven and tour tested the FC-ONE PRO will deliver a lower launch with lower spin when compared to other steel shafts in the same weight category. The new VERSA blank is designed specifically for clubmakers who are building custom clubs and desire the need for frequency matching. This single shaft quad flex design reduces sku’s while providing the clubmaker the ultimate in versatility through customized trimming options.